Intacct delivers a comprehensive, fully-integrated financial management and accounting system meets the needs of your evolving business. Intacct builds amazing professional-strength financial management and accounting applications that fit into your existing business infrastructure and integrate well with the key applications you use to run your business—giving you the freedom to choose and deploy the best applications for each of your departments. And, being in the cloud, you can access from any location, and have the confidence that your data is protected and secure. 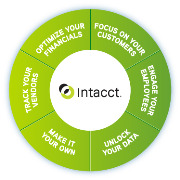 Named by the AICPA as its preferred provider of financial applications, Intacct has helped thousands of companies, from startups to public corporations, improve financial, managerial and operational reporting and analysis, improve lead to cash cycles, shorten days sales outstanding, optimize cash management, reduce operating costs and increase business value.